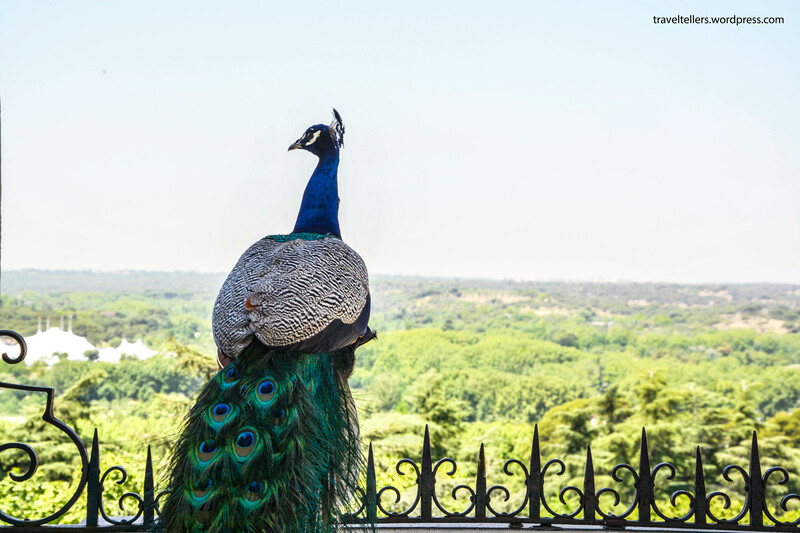 After being exhilarated by the Italian capital and being slightly disappointed by the French capital, it was the turn of the Spanish capital – Madrid. Though in all honesty we did not have high hopes from the city as it doesn’t feature in any of the Europe’s must see itineraries and if we didn’t have to catch our return flight from Madrid then we would have skipped it. The one day we spent in Madrid conformed to our prior expectations as we found the city to be good without being great. A 5:00 pm train from Malaga got us to Madrid Atocha station by 7:45 pm. In Madrid we had booked Hotel Nuevo Boston which we had selected because of its proximity to the airport. It was a standard business hotel with an extremely nice room. Reaching the hotel from station was not quite straightforward this time but we did manage it eventually with a combination of metros and buses. On reaching the hotel, we checked in, had a quick dinner and went to bed early so we would be completely fresh for the next day. We started our final day in Europe with the Palacio Real de Madrid (Royal Palace of Madrid). It took us a combination of bus, metro and a short walk to reach the palace. The Royal Palace of Madrid was a huge white building overlooking a large central courtyard known as Plaza de la Armería. This palace which was constructed between 1738 and 1755 is incidentally the largest royal palace in Europe. Just opposite the palace complex was another imposing structure – Cathedral de la Almudena. We entered the palace complex and took a few pictures of the building from the courtyard. We then began our visit with the Real Armería de Madrid (Royal Armoury of Madrid) which was situated in one of the side buildings of the palace. The armoury had an impressive collection of weapons, shields, armours and other items but it wasn’t really to our interest. After that we visited the main palace where we saw the grand staircase, apartments of kings and queens, a large banquet hall and a few other rooms. Photography was prohibited inside the palace hence we could not get good photos of the interiors. A few of these rooms, especially the banquet room, were truly gorgeous but by now our benchmark consisted of far superior palaces like Palazzo Pitti and Palazzo Vecchio of Florence, Palazzo Ducale of Venice, Château de Versailles of France and Alcazar of Seville. Due to this we found this palace to be the least impressive of all the palaces we had seen on our trip. 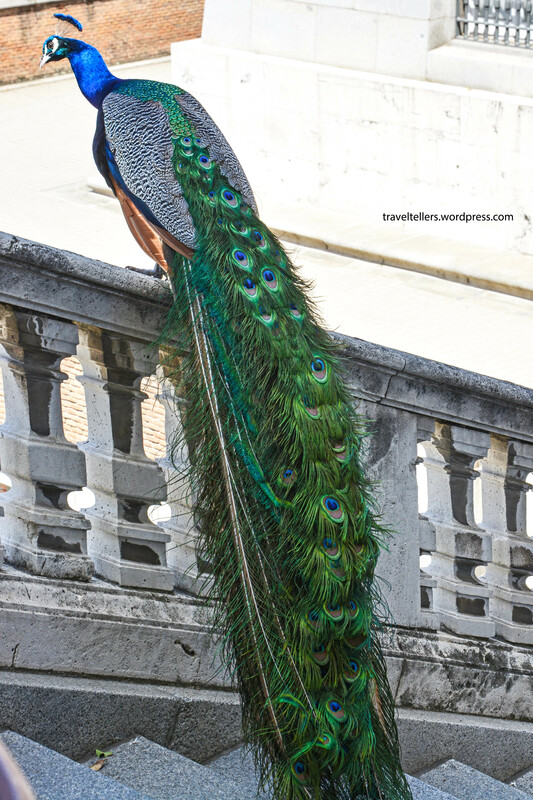 In fact the most memorable moments of our visit to the royal palace involved a peacock that had strayed into the palace complex and became an instant mini-celebrity among all the tourists present in the vicinity. Our next destination presented the strangest sight of our entire trip – an ancient Egyptian temple in the middle of a quintessential Spanish park. ‘Well, how did this happen?’ We wondered. The story goes that during the 1960s, due to the construction of a new dam, many Egyptian monuments were in danger of getting submerged but they were saved by the assistance of Spanish engineers who helped relocate them. The Egyptians gifted this temple to Spain as a token of their gratitude. I guess when you have so many of those, one more or less doesn’t really make a difference. Anyways, I don’t know whether it was Egypt’s loss or not but it most certainly was a big gain for Spain and more specifically Madrid. The temple, known as Temple of Debod, consisted of a main building with two gate-like structures placed on a platform surrounded by a rectangular moat filled with water. The temple is generally open for visitors but it was closed when we were at the site. We saw the temple and then spent some time sitting in the shade of one of trees in the park as it had become quite hot at that time making it seem like the heat had followed us all the way from Seville. After our visit to Temple of Debod, there was just enough time to visit one more site. We chose the most famous museums of Spain –Prado Museum as the final destination of our Europe trip. A bus ride and a short walk got us to the museum. We bought tickets and entered the museum getting an immediate respite from the intense heat. We got hold of a map and started exploring the museum. The museum had a large collection of paintings, sculptures and other pieces of art which included fantastic works by masters such as Caravaggio, Titian, Raphael, Goya, Murillo and El Greco. To our disappointment photography was prohibited in most of the rooms of the museum. After we had completed our visit to the museum we had an early dinner and then, that was it! Our Eurotrip was over. We went back to the hotel and took a 10 am KLM flight the next morning with a plane change at Amsterdam. What we took back were 32 days of memories that we will cherish for a lifetime. Before we sign off we want to leave you with an anecdote which we find quite funny and hope you might too. Our country is unique in many ways and there is one particular gesture that adds to that uniqueness. While listening to someone, especially when that person is explaining something, you might have found yourself slowly moving your head from side to side. This gesture is known as the Indian Head Bobble. While in most cultures shaking your head from side to side indicates ‘no’, in our culture it is used to denote understanding or agreement. Now I don’t know how this started but I guess it could have something to do with our education system in which students often don’t have any idea about what they are being taught and generally sit in a dazed condition. But as soon as the teachers look at them they have to indicate that they are in tune with the topic being taught and in that dazed condition the easiest movement is shaking one’s head slowly from one side to other. Don’t believe me? Try moving your head up and down and then try that slow sideways shake. In fact this head bobble is imbibed in us so deeply that we do it almost unconsciously and many a times it has become a source of utter confusion for foreigners. Well something similar happened with us too. After reaching our hotel in Rome we asked the receptionist some routine questions about bus timings and route to the city centre. As he started explaining we automatically started our head bobble. He suddenly stopped speaking and said “No?” We immediately realized our mistake and told him to go on. After this incident we were very careful about our head bobbing but at Avignon bus station a French lady behind the ticket window again became a victim of it. After that we decided to keep our head still and use our mouth to say ‘yes’ or ‘no’ and this is the principle we will be following if we ever meet a foreigner again. Yes that was a real surprise. An ancient Egyptian monument in the middle of Madrid. Nice post.I visited Temple of Debod in the night and it was stunning.Couldn’t see the Prado Museum as I got lost in the festivities at Puerta del Sol.Amazing city . beautiful photos! Madrid is great! Thanks for this! Planning a trip to Madrid in December! You’re welcome 🙂 Best of luck with your travels.